If there is one thing that you should know about dining in Italy, it’s that booking is essential. Even for lunch. Sure, you can always wander the streets and pop into a place that looks lively– taking a chance here and there in the name of dining spontaneity, but I for one, prefer to have a loose game plan, utilizing the recommendations of locals and friends. The truth of the matter is, some of your best dining options (budget and fine dining-wise) will require a bit of advanced planning, so don’t be put off if you’re turned away and the restaurant seems empty at the time because more than likely, they’re “e al completo” (fully booked). For our first lunch in Venice, we decided on a casual lunch at Ristorante San Trovaso in the Dorsoduro neighborhood close to the Academia. Our reservations were confirmed via e-mail about four weeks prior to our arrival, but somehow I had missed their cancellation e-mail one week prior letting me know that they were actually going to be closed for a private event that day. 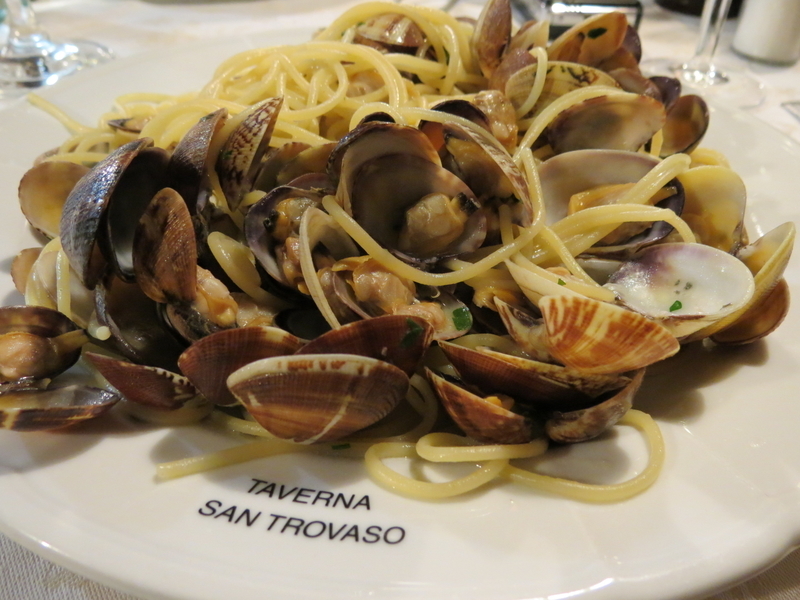 Luckily, I was able to scan my e-mails on my phone and find the message where they recommended going to their sister property, the Taverna San Trovaso, located just around the corner. Slightly discouraged, we made our way to the Taverna. Since it was early enough, we were seated immediately for lunch at noon. The menu at this location featured many similar dishes as the Ristorante with the addition of pizzas in a livelier setting. 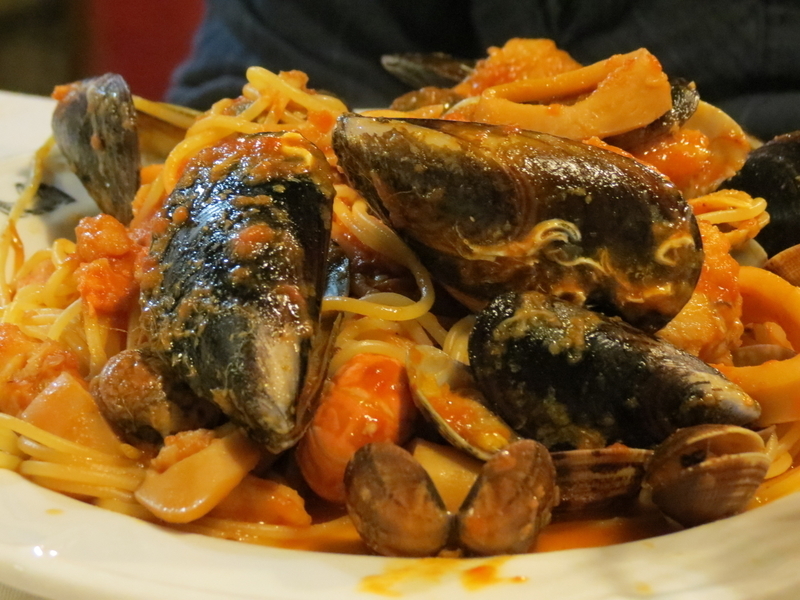 Based on the recommendation of a few blogger friends, we opted for the mixed seafood appetizer and two pasta dishes to accompany our locally-produced Prosecco. The stand-out for the meal for me was definitely the spaghetti with clams, which was surprisingly quite similar to the dish I attempted before vacation. The misses of the meal were minor and were all part of the mixed seafood appetizer. While the dish looked great (see above photo), I didn’t care much for half the platter; namely the over-brandied scallop gratin and the steamed whole baby octopus which was not cleaned out very well. Luckily, the shrimp on polenta and baccala mantecato were pretty good– but I probably won’t be ordering this here again. Overall, this first lunch experience was mostly positive. 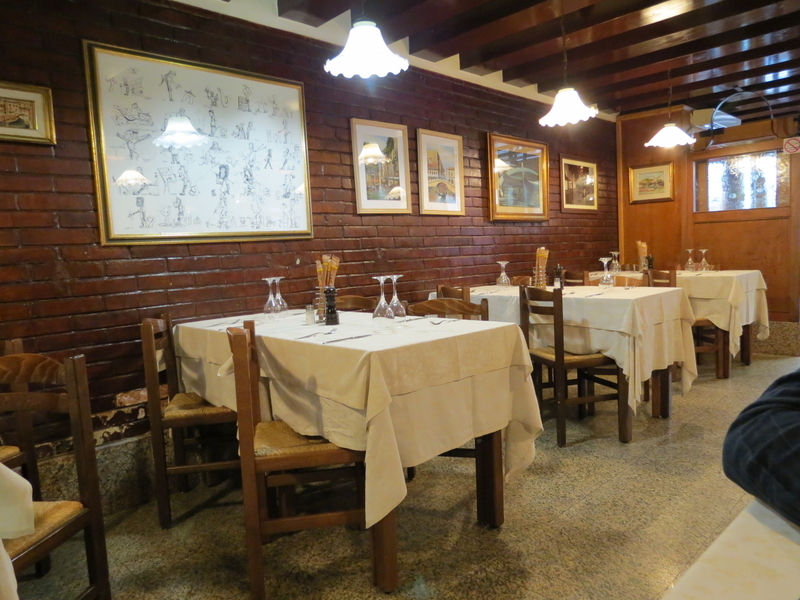 Prices were reasonable, service was prompt (even by Italian standards), and the food was mostly good. Atmosphere was cozy and the added benefit of staff that could speak a little English helped,considering we were running on zero sleep and were too delirious to speak exclusively in Italian. 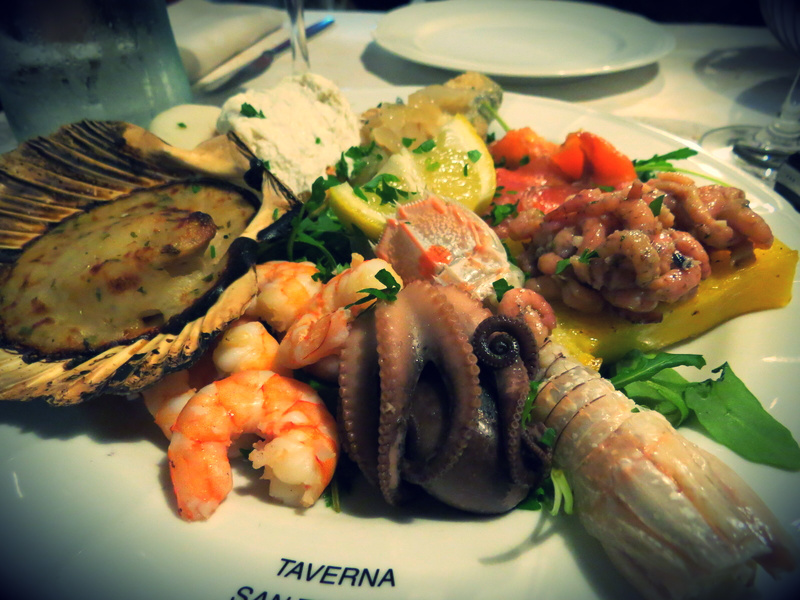 I probably won’t be rushing back here next time I’m in Venice, but if you’re in need of a casual lunch on a rainy day and are without reservations, Taverna San Trovaso isn’t half bad.